Is your gym wardrobe feeling stale? Add some oomph with a pair of cute, fun, and on-trend patterned bottoms. Is your gym wardrobe feeling stale? Add some oomph with a pair of cute, fun, and on-trend patterned bottoms. (Yes, you can pull them off!) Here, 10 eye-catching pairs that we are totally psyched to sweat test. The geo print Oiselle Off The Grid Knicker ($68; oiselle.com) is sure to keep your workout fresh. Give those basic black capris the boot and slip on the less-traditional Asics Crazy Pants Capris ($56; zappos.com) instead. 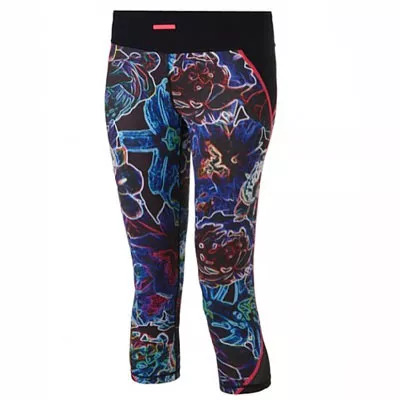 The colorful hits along the sides of the Adidas Techfit Printed Capri Tights ($45; zappos.com) are more than just cool: They instantly slim your hips. nike.com) remind you of your favorite childhood finger painting class. You’re sure to turn heads in your next spin class with the Onzie Mesh Capri Pant ($56; nordstrom.com). Bonus: Strategically placed mesh will help keep you cool while you ride. For you 80’s babies: Remember the arcade game Q*bert? The Athleta Triangular Be Free Tight ($74; athleta.gap.com) offers it’s fun take on the game’s signature backdrop. 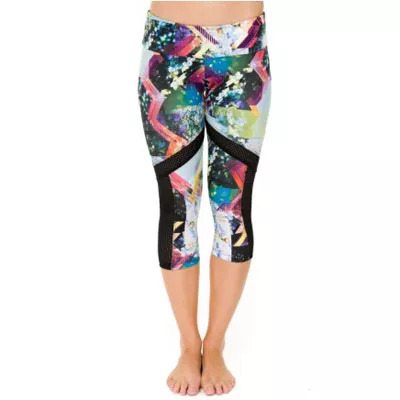 Soar through your next sweat sesh with the celestial-like Under Armour Perfect Tight Printed Capri ($60; underarmour.com). The perfect accessory for your next step class: the Reebok Neon Lights Legging ($50; reebok.com). They totally let your inner light shine through. 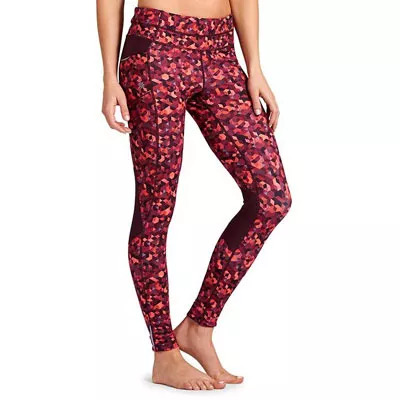 The high waistband on the Pointillism-inspired Lululemon WunderUnder Pants’ ($102; lululemon.com) hides not-so-tight tummies.